Little else is known about the creator of this artistic masterpiece from 1,800 years ago, who worked neither quickly nor cheaply. The artist who made it some 1,800 years ago was apparently the greatest mosaic artist ever to work in this land. 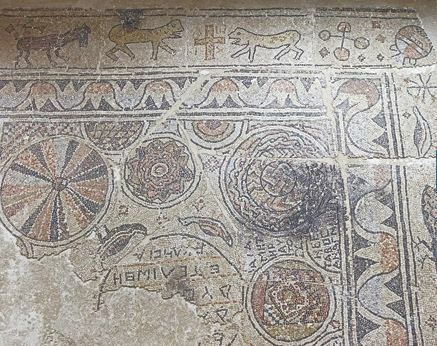 The laboratory has another large mosaic, excavated about 40 years ago in the Lachish area that also features lions and other animals, and geometric patterns. But the lion's mane and tail are missing and the donkey has a limp, the peacock's foot is distorted and the circles are crooked. The Lod mosaic has earned its place of honor outside the conservation laboratory of the Israel Antiquities Authority. 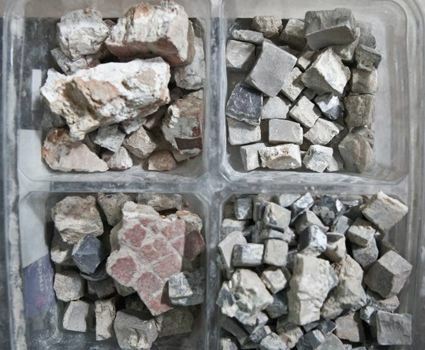 The laboratory, in the courtyard of the Rockefeller Museum in Jerusalem, contains hundreds of mosaics collected over about a century of archaeological exploration in Israel. 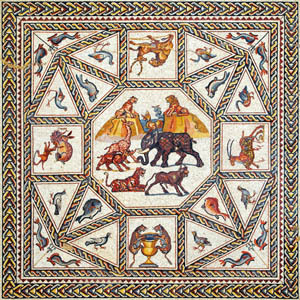 But the 180-square-meter Lod mosaic, with its dozens of meticulously executed animal images enclosed in spectacular geometric patterns, is the crown jewel. But Jacques Nagar, the lab director, loves them all. "It's primitive, but you'll never make another like it ... it's beautiful," he says. Nagar, 59, who came to live in Israel from Bulgaria in 1996, heads a small staff responsible for the artistic conservation of artifacts including ancient anchors, frescoes and stone reliefs. 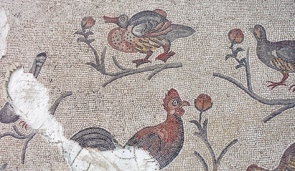 But most of the work involves mosaics, which have been discovered at no less than 7,000 sites. Almost all are recovered so they incur no further damage than time has already inflicted. The most beautiful, when they cannot be conserved or protected on the site, are brought to the laboratory. They range from simple white-stoned grape-treading floors to the Lod masterpiece, which once adorned a Roman-period grand assembly hall. 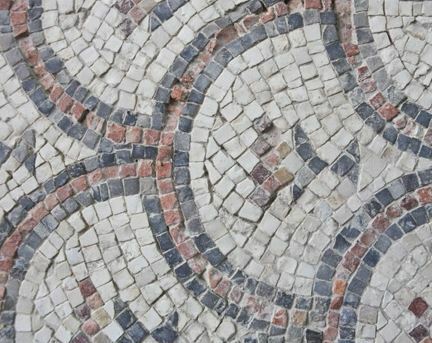 Mosaics can tell about the house they once adorned; indentations, for example, can indicate furniture. But they also reveal secrets about artists, market forces and changing and competing fashions. The Lod mosaic was found 16 years ago when a tractor hit it by accident. An Israel Antiquities Authority inspector saw the very tip of a panther's tail, and stopped the work. Archaeologist Miriam Avissar started excavating, and slowly but surely the treasure emerged: an elephant trapped in a hunter's net, a giraffe (mistakenly sporting antlers ), lions, ducks, fish, deer, a peacock, wolves and snakes. Ships also appeared. Some of the animals are hunting - a panther holds a bleeding deer, a snake swallows a fish, even a little vegetarian rabbit is seen snacking on a cluster of grapes it seems to be sharing with a wolf. To conserve it and also allow it to be moved, Nagar supervised its cutting into pieces, and backing with a lightweight aluminum and fiberglass frame. Although the technology has come a long way from the heavy concrete backing once used, Nagar says: "I don't believe in modern materials." And so a thin layer of plaster, similar to the original, has been inserted between the mosaic and the aluminum construction. "A mosaic you make once and you don't touch it again for 2,000 years. Today we want things quick and cheap," Nagar says. Whoever laid this mosaic worked neither quickly nor cheaply. Nagar believes the mosaic master was world-famous, and from the zoological repertoire, came from North Africa. Commissioned for this job, he would have arrived with a small entourage of assistants. After his patron - probably a wealthy merchant - picked the designs from a catalogue, the master would begin planning. The space was leveled and then overlaid with stones and pieces of limestone for strength, followed by two layers of plaster. The master would then sketch the design with pigment powder and his assistants, artists in their own right, would begin the Sisyphean work of laying the tiny stones. The floor is made of some two million such tesserae, measuring about 0.8 cm each. All were naturally colored and interspersed with pieces of glass especially made for the mosaic, and some were gilded. "That means the hall was not used by crowds - you don't use stones like that where a lot of people were walking," Nagar says. Something else distinctive about the artists has emerged: One wore a size 43 shoe, another was shorter and wore a 36, and women and children also worked on it. 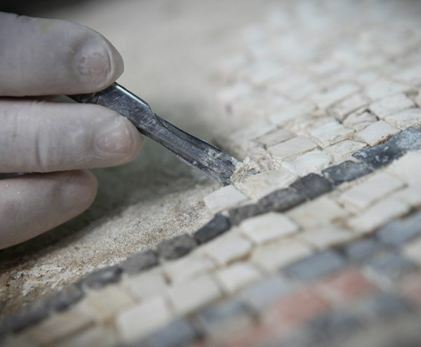 Nagar and his staff discovered this when the original plaster backing, revealed during the mosaic's removal, was found to contain footprints. The antiquities authority and Padua University in Italy are now studying the footprints with laser scans and examining the plaster's make-up to learn more about the artists, such as their height and weight. "Someone worked and left this behind; now I'm working. There's a psychological connection here," Nagar says. Construction of the new museum will be made possible thanks to donations by the Leon Levy Foundation and donor Shelby White.